From Varenna take the road signposted for Esino Lario continuing as far as the hamlet of Vezio (keen walkers can make their way on foot, following a path that starts near the centre of Varenna): Vezio's castle is then only a short walk away, through the village. The Castello di Vezio holds a key strategic position, practically at the centre of Lake Como. For many centuries the castle was used as a lookout and signalling post. It has ancient origins: it came into being as a military settlement in Roman times and retained this role both in the Byzantine era and later - around the 8th century - when the Longobards controlled the area. 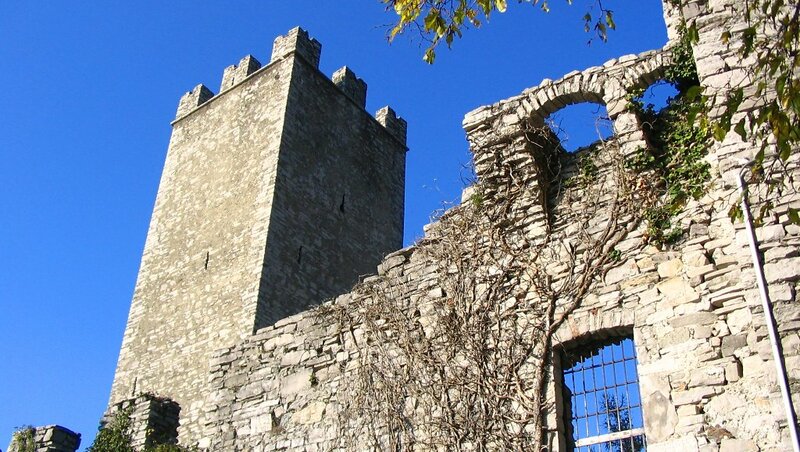 When, in medieval times, the people of Como plundered the Isola Comacina, Vezio's castle was one of the places where the refugees regrouped and prepared new defences. Vezio's castle has inevitably undergone many changes since the Middle Ages, but it remains a fine example of a square-plan enclosing castle, with a stand-alone tower within its walls. Perhaps the most appealing aspect of this site for its many visitors is the unique, thrilling view it offers of Lake Como. Stretching out before your eyes are the two arms of the lake: the cities of Lecco and Como are now out of sight but the promontory where the arms meet, close to Bellagio, is a clearly visible landmark.